A cute kitten is sitting in a stocking. Notice the mouse and the candy cane. 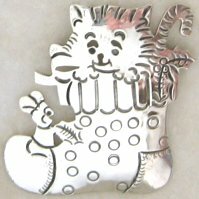 This large pin is made of sterling silver. It is 1 7/8" wide x 2" high. Note: the pink color on the top right hand side is a reflection from the camera. Pin is boxed.